The Indian Solar Industry has immense potential for a tropical country like India where around 45% of households, mainly rural ones, do not have access to electricity, according to the "Indian Solar Energy Market Outlook 2012". The industry has witnessed rapid growth over the past few years and is projected to grow further in future. As India is blessed with ample solar radiation and most part of the country receives 300 to 330 sunny days in a year. India today receives solar energy equivalent to more than 5,000 Trillion kWh per year, which is far more than its total annual energy consumption. India's geographical location, large population and government support are assisting it to become one of the most rapidly emerging solar energy markets in the world. Gradually India is becoming a favorite investment destination for both local and global players. Today Indian economy has the second-fastest rate of increase in GDP in the world - 7.1%. The country accounts for one thirds of the world's population without access to electricity. The situation arises despite several initiatives and policies to support poor households. Five different ministries have structurally handled the Indian energy sector from which among them the Ministry of New and Renewable Energy. India is probably the only country in the world with most dedicated ministry for renewables. The country ranks sixth in the world in terms of total energy consumption and needs to accelerate development of the energy sector to meet its growth aspirations. Although the country is rich in coal and abundantly endowed with renewable energy in the form of solar, wind, hydro and bio-energy, India has very small hydrocarbon reserves (0.4% of the world's total). Being a net importer of energy, more than 35% of the country's primary energy needs are ensured through import. Today with growing advancement and pace of development India needs more power. Not only to cover its daily power shortfalls (several hours per day), but also to support its economic development. In 2008 According to CEA, the peak demand was 120 gigawatts of power, while only 98 gigawatts could be supplied. According to an analysis by the Indian PV project developer Astonfield, quoting the President of India Energy Review, this deficit is likely to grow to 25 gigawatts by 2012. The targeted share of renewable energy is 24% for 2031, with the amount of solar energy increasing to 56 gigawatts of installed power. In India Demand for solar products has been rapidly rising for the recent years, especially in rural areas, and is expected to continue growing substantially during the period (2011-2013). Most popular applications in India are Solar street lighting systems, home lighting systems, power plants, solar cookers, solar pumps and solar water heating systems. The number of solar water heating systems is projected to grow at a CAGR of about 22% between 2011 and 2013. Many states have started promoted solar based applications by giving incentives and tax savings. In order to boost the Solar Industry States like Gujarat and Rajasthan have formulated transparent and progressive regulatory framework. Besides, states like Delhi, Uttar Pradesh, West Bengal, Maharashtra and Chandigarh are promoting solar energy in rural, urban and semi urban areas. After all the efforts the average electricity consumption in India is still among the lowest in the world at just 630 kWh per person per year, but this is expected to grow to 1000 kWh within five years. Speaking of big numbers and energy consumption: every month 8-10 million new mobile phones are connected in India. This is an interesting market segment for solar PV as well: thousands of new GSM poles will be needed across the country. In 1976 The Solar Energy of India (SESI), established having its Secretariat in New Delhi is the Indian Section of the International Solar Energy Society (ISES). All aspects of renewable energy, including characteristics, effects and methods of use are covered and it provides a common ground to all those concerned with the nature and utilization of this renewable non-polluting resource. With the distribution of 10 million solar lanterns in remote areas and to nomadic populations, India could save 500 million litres of kerosene a year. The government has mandated that 12% of all electricity is to come from renewable sources by the year 2010. 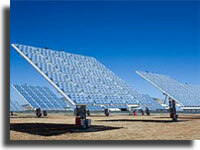 The Indian solar power production is slated to grow to 500 MW by 2012. Residential clusters or the "colonies" in India. There is a strong sense of community among the colonies of urban and suburban. Thousands of employees and huge arrays of power-hungry computer equipment. Rural townships and villages - it is an immense market and would typically be government-funded or non-profit funded installations. A target for electrifying 5,000 such villages was fixed for the Tenth National Five Year Plan (2002-2007). Individual Residences are good significant number of private citizens who are in a position to afford solar power installations e.g. being "green." 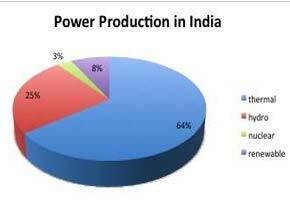 Large government power production facilities - on 1- to 5-MW power plant facilities as well as its larger goals for upgrading India's overall power production. The Indian Solar Energy sector has been growing rapidly, in the past few years, majorly due to Governments initiatives such as tax exemptions and subsidies. Due to technical potential of 5,000 trillion kWh per year to minimize the operating cost, Solar Power is considered the best suited energy source for India. Today the Solar power has an installed capacity of 9.84 MW which is about less than 0.1%, currently total installed renewable energy stands at 13,242.41 MW as per MNRE. India Consumes 3.7% of the world's commercial energy making it has the 5th largest consumer of energy globally. Total Installed capacity of 144912 MW. 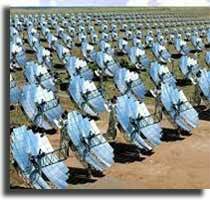 India is endowed with rich solar energy resource Over 5,000 trillion kilowatts of solar energy in a year. The average intensity of solar radiation received on India is 200 MW/km square. Planned and unplanned Solar Power outages of 4 to 1O hours a day for households and business are common. Upwards of 40% of electricity is "stolen" in India - not paid for - thereby increasing the cost of electricity for the paying consumers. Solar-based energy today accounts for only 0.5% of that number with a grid-interactive (grid-hybrid) solar power totaling only 2.12 MW from just 33 such installations. The Indian Gross Domestic Product (GDP) is targeted to grow at 8% over the next ten years. At this rate, power demands may rise from the present 120 GW to 315-335 GW by 2017. Consumer demand is growing at 14% over the next 10 years - faster than the GDP rate! BHEL, BEL, CEL, TATA BP Solar India Limited, Solar Semiconductor and Moser Baer India Limited. 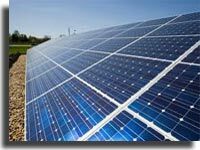 India recently had opened tenders for 500 MW of Photovoltaic Solar Energy with 5 MW being the fixed size of a plant. Government has got bids for 10,000 MW or 20 times the amount to be bid according to he recent reports. This implies that the PV portion of the Phase 1 of JNNSM will go for discount bidding. In layman terms it means that the projects will be awarded to companies willing to build the plants at a discount to the CERC mandated FIT rate of Rs 17.91/KwH. As the Indian government has announced the incentives for manufacturing solar cells and panels earlier this year, it has targeted meeting 10 % of the country's power needs through renewable energy by 2012. Tata BP Solar, a joint venture between the Tata Group of India and BP Solar of the United Kingdom, operates one of the oldest solar-energy equipment manufacturing plants in India, near Bangalore which would be expanded now, at an additional investment of $100 million. India is ranked 7th worldwide for solar photovoltaic (PV) cell production and secure 9th rank in solar thermal power generation. Indian Solar capacity is growing rapidly due to the entry of various private players in manufacturing of solar energy equipment. According to analyst and scientists the Indian solar energy sector is estimated to grow at 25% year on year in next few years.